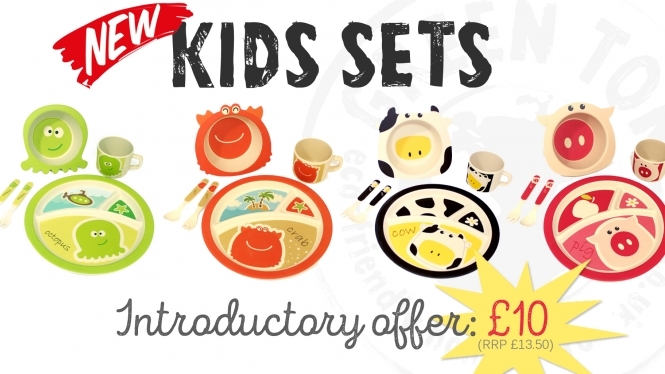 Check Out Our Kids Sets! 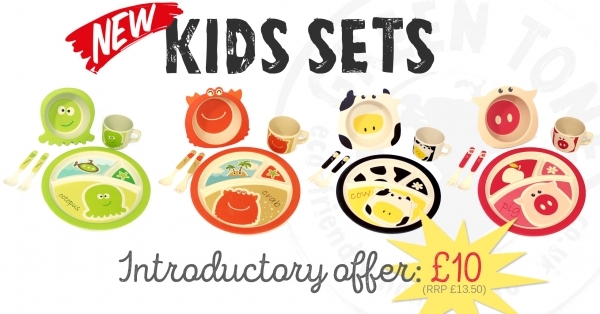 Have you seen our new kids sets? They're nothing less than adorable and come in four great animal designs: Cow, Pig, Crab, and Octopus. Like all of the other items in the Green Tones range, our kids sets are eco-friendly as they are made from the recycled material Bamboo Fibre. They are lightweight, which makes them great for taking around with you when you're on the go or using at the family picnic. They are also tough enough to be used regularly, and are even dishwasher safe! They come complete with a bowl, sectioned plate, cup, fork, and spoon. So whether you're still feeding little one or they're learning to feed themselves, these brightly coloured sets will make meal times more fun. What makes them even better is that for a limited time only these sets are available at the introductory price of £10 (RRP £13.50), so get yours fast!